Konan RAPDx | Blue River Medical, Inc.
With RAPDx®, Konan has now substantially enhanced our view of neuro-pupillary dysfunctions. After a century and a half, it was about time. Pupil defect testing began in the 19th Century, but until now, has been subjective, difficult to perform well and not conclusive. As a required part of a standard eye examination, the notation “PERRLA – MG” commonly appears (if the testing was even performed) on the majority of patient records. Even with the best of intentions, this is perhaps unwittingly inaccurate. 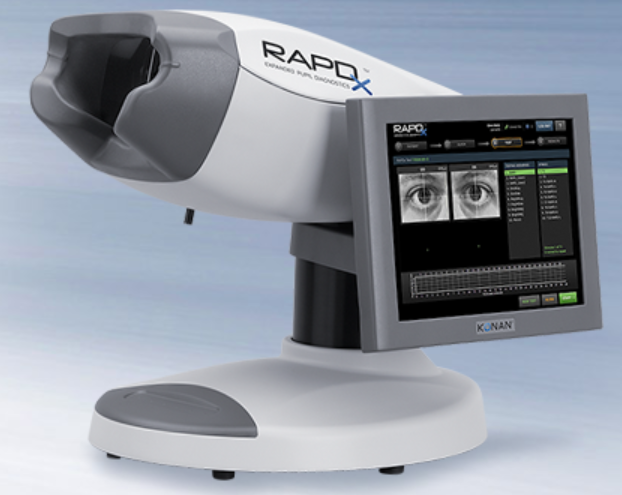 RAPDx records a high-definition, biometric waveform of the pupil responses, the “RAPDx Signature™”, which characterizes key features of pupil defect responses beyond those seen by human observers of the old Swinging Flashlight Test. RAPDx presents clear detail of the differential pupil responses which can be displayed as as Amplitudes or Latencies. An analog of the Swinging Flashlight test can be performed as a fast screening test. Normative data is under development for characterizing specific conditions.  Touchscreen operator interface (tablet size).